Limestone pavement, sheep and the Pen-Y-Ghent in front of colorful morning clouds in the southern part of the Yorkshire Dales. 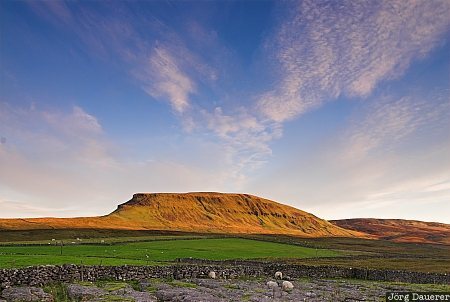 The Yorkshire Dales are in the northern part of England, United Kingdom. This photo was taken in the morning of a sunny day in September of 2007. This photo was taken with a digital camera.